Dual Beam FIBs are a relatively new type of instrumentation. They consist of a high-resolution SEM column with a fine-probe ion source (Focused Ion Beam). These instruments allow the preparation of samples from specific areas of a sample as well as nano-machining. The Helios NanoLab™ 600 is equipped with an extremely high resolution Elstar™ electron column with a Field Emmission Gun (FEG) electron source. It is capable of <1nm @ 15kV and <2.5nm at 1kV electron beam resolution. The Ga+ ion source can image and machine down to 5nm resolution levels. Adding to the imaging and sputtering capabilities are a light element X-ray EDS detector and an electron back scatter diffraction orientation imaging camera. 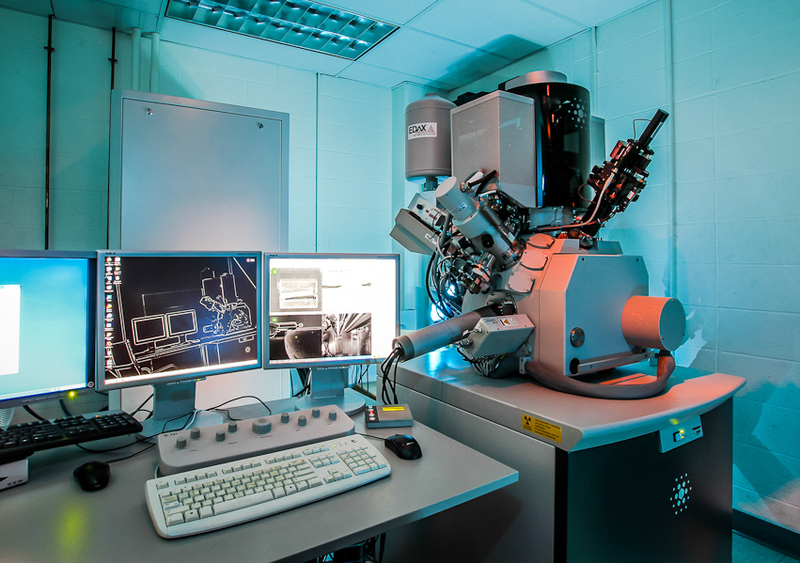 The OmniProbe AutoProbe™ 200 in-situ sample lift-out system allows the preparation of site specific TEM samples without the need for support films. This is necessary to fully utilize the high resolution capability of modern TEMs such as the Titan. The combined sputtering and imaging and analytical capability makes DualBeam FIBs extremely versatile and a key component in a world class nano-characterization facility.